This one is going to get interesting. Very little separates the top seeds in a race that will matchup some up-and-coming newcomers with some talented veterans. There's no clear-cut favorite in the girls 800 meters. Taryn Parks of Greencastle-Antrim enters as the top seed after a late-season 2:12.01 at Penn State in the last week of the season. She'll be coming off the mile, where she's also the top seed. She'll be looking to double back against this strong field. 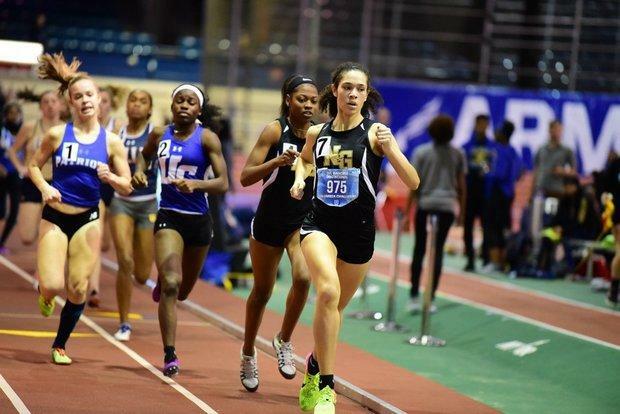 Neumann Goretti's Kami Joi Hickson ran a solo flat track 2:13.60 to win at last week's DVGTCA Meet of Champions. Hickson proved there that she's ready to make a run at a state title in the 800. There are a pair of freshman that figure to make some noise in this field. Friends' Central's Micah Trusty has shown some great range this season, and the 800 may be her best event. She won at Ocean Breeze in 2:13.55 and can make a run at the win. Saint Basil's Alina LaForest is another impressive frosh. She went 2:15.35 at the DVGTCA MOC for second to Hickson (but winner of her heat). She'll likely be the top seeded fresh girl in this field. The top seniors in the field are Strath Haven's Grace Forbes and Greensburg Salem's Malia Anderson. Forbes ran 2:13 at Ocean Breeze (just behind Trusty) and will come in hungry for her first individual state title after a second place finish at outdoor states last year. Anderson, who was fifth last year in this event, has been consistent all season long, never backing down from strong competition. Expect both to be in the mix for the win. There are three other returning medalists in the field: Cardinal O'Hara's Christine Mancini (fourth), Central Dauphin East's Makenna Krebs (sixth), and Coatesville's Sammie Miller (eighth). That's a talented and experienced trio of seniors that know how to handle the big stage. They'll be in the mix. Look out for Radnor's Keara Seasholtz too. She was fifth at outdoor states last year and has been getting faster and faster in the 800 as the season has progressed. Many of the top contenders here will be coming into the 800 after having run events earlier in the meet (most likely the 4x8). How they recover from those races will go a long way towards determining a winner in this wide open field. It's still, however, going to take a very quick time (potentially sub-2:10) to win this title.